Have you ever wondered what some of the foods you've seen in the movies would taste great or not? Because when they served in the movie, it looks delicious and scrumptiously tempting. And here I've tried my hand at the very own, Julia Child's Bruschetta from the movie Julie and Julia, which was originally a true story about a woman whose passion was into eating and finally turn it into a lifelong dream of cooking. Long story short, the novel was a success and it was made into a movie, where Meryl Streep takes up the role of Julia Child while the sweet charming Amy Adams turn up for a different role than her usual character as Julie Powell, a 30 year old woman in her mid life crisis trying to balance out her work and her responsibilities as a wife. To escape it all, she ventures deep into the world and cooking and find harmony in it. She enjoys cooking so much and takes up after Julia Child as her idol. In the movie itself, Julie was cooking this delicious Bruschetta whilst complaining about her daily work to the husband. As it strikes me there, I saw that dish and how she did it and manages to catch a glimpse of what was inside of it and the ingredients. Although I could only make up a few ingredients such as the baguette she used as the base and mainly tomatoes and some leaves (I can't tell what are those; was it basil, parsley or coriander?). My sister saw it too and asked me if it was hard to make. And I told her, not really. And so began the journey to try out this Bruschetta on my own. Being a Malaysian, we don't have much of the option into lavishing the cooking ingredients from the outer regions, although we maybe rich in spices, we lack some of the other fresh ingredients. I drove by to Tesco to get some of the ingredients that should matter for a Bruschetta (baguettes and tomatoes), and bought a few extra ingredients to tweak it up a bit. 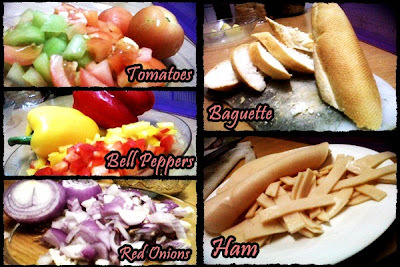 So here are the ingredients that I used. I didn't like the taste of some leaves (like Basil) so I've customized the Bruschetta to my liking. I've sliced the baguette as the base, dice-chopped the tomatoes, onions, and even the peppers. And if you realized, the onions and the peppers are not in the original recipe, but I added it up because I love onions and peppers are for more solid bite rather than the mushy tomatoes. And I've even added some thinly sliced chicken hams to it. 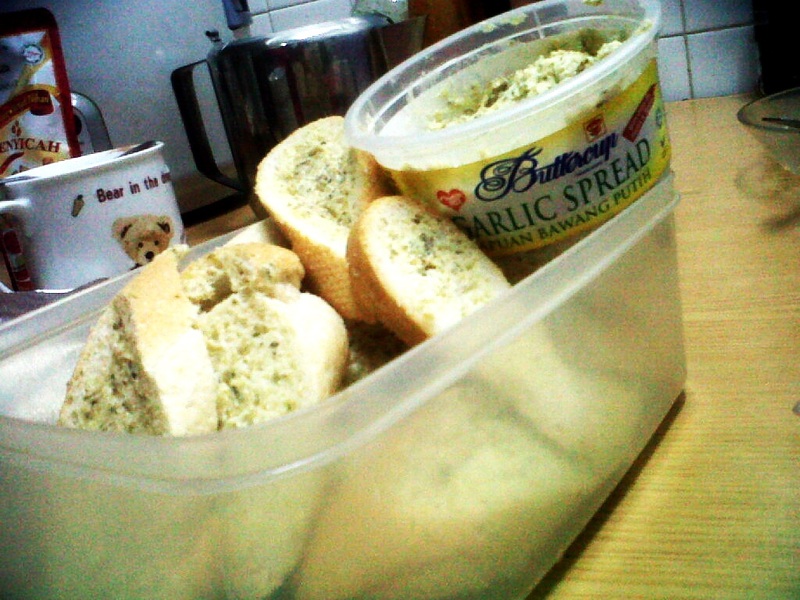 And for the baguette, I did not just simply toast it bare, I spread some garlic butter on it to give the extra flavor. 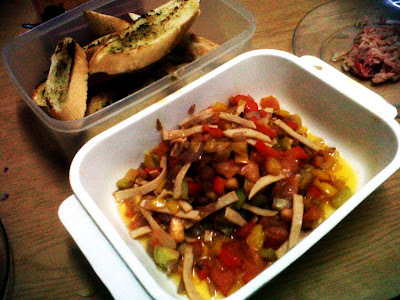 So, my Bruschetta is not really Julia Child's Bruschetta but at the very least, the foundations are the same. I have the baguette, the tomatoes, and some other veggies, the only thing different is that I have more ingredients, and I did not tossed the ingredients together in a salad bowl and drizzled with olive oil or even extra virgin olive oil. What I do with the ingredients is that I tossed them, under the searing hot flame over a cooking pan. Although it really defeats the sole purpose of 'tossing the ingredients' like salads, I made it to my own. Customization is everything if you want to make things to your liking. At the very least, my Bruschetta is delicious. IT might have tasted different from Julia Child's version, but at least it tasted good. Don't believe me, try making your own. Don't follow my recipe though, it's more of a 'toss in, toss out, random cooking' style of cooking. Well, at least my sister likes it. 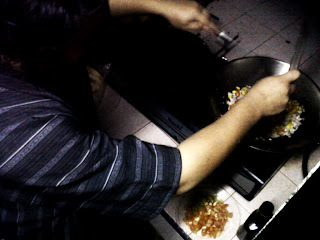 She asked me to teach her how to make it, so that she can do it on her own next time. See, mission accomplished; my sister love the Bruschetta. Hahahahahaa!! !